You are here: Home / Blog / News / What Do New Delivery Trends Mean for Your Restaurant Business? Ride sharing isn’t the only smartphone app boom to disrupt an industry. The food service equivalent is app-based delivery. Those wanting to dine at home are no longer limited to pizza and General Tso’s chicken, or a takeout run. These apps make nearly any cuisine deliverable—and multiple styles for choosy group orders. So, what does this mean for local restaurants? Most restaurants value in-store service over takeout and delivery because they can craft and control the diner’s experience. Food alone does not always define customer satisfaction; branding and customer experience are very significant factors. When the equation is reduced only to the food, these important touchpoints are lost. And when the food is handled by a 3rd party before reaching the customer—as is the case with app-based delivery services—it can be a nail-biting experience for restauranteurs. However, it can be even more damaging to a business to pass up the opportunity to serve consumers through these platforms, especially if the competition has embraced it. 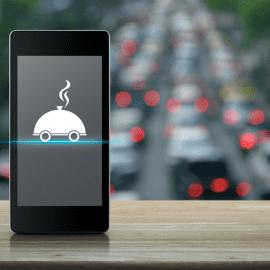 While the increased demand for delivery services may mean more open seats in your restaurant, it (hopefully) still adds up to revenue growth. It’s an opportunity to generate more sales. Not only can you meet the occasional delivery needs of your regular dine-in patrons, but to also tap into the marketplace of new customers who have only found you now that you offer delivery service. It’s also an effective way to increase income without expanding your restaurant’s physical footprint. The overhead to support delivery is much lower than that required to accommodate a larger or additional store. Make it easier for service staff to do their jobs. The preparation, plating, and delivery for door-to-door (or even takeout) service can be very different than for table service. Designated back-of-house space to keep staff from tripping over each other will help everyone involved in the process. Use a small amount of table space to promote your delivery offerings, and how customers can make use of it when they can’t come into the restaurant. If you also offer takeout, make the trip from the car to the counter as streamlined as possible so customers can quickly pick up their order and be on their way. If possible, offer an alternate entry so that dine-in and takeout customers don’t pile up at the host desk, but can easily be taken care of by the appropriate staff. Delivery apps have boomed not only because they are easy for consumers, but because they meet a need for restaurants. Unless a store’s food service model centers around delivery, it hasn’t been practical to offer the service—until now. 3rd-party apps put the delivery service into the hands of “contractors”—drivers who earn a little extra income by picking up and dropping off the food orders. It can be scary to entrust your food and customer experience into the hands of an unknown 3rd party, but since it is an income opportunity, most drivers are highly motivated to provide great service as an extension of your brand. Plus, if your competitors are found in these spaces, you should be too. Not all dishes travel or “keep” at a similar quality to when they are first served. If you have menu items that must be served and enjoyed right away, keep them on your primary menu, but don’t offer them for delivery. Optimize the delivery menu with items that will still be awesome 45-60 minutes later. Your customer experience will still be excellent, and they’ll be motivated to come in and try the full menu in person. The demand for delivery is a growth opportunity much more than a threat to your normal way of doing business. Embrace the change and optimize your restaurant and business practices to support both dining preferences. Over all you’ll be able to reach far more patrons than with in-person dining alone. https://www.apronsandsmocks.com/wp-content/uploads/2018/10/2_13.png 270 270 Mike Cielinski https://www.apronsandsmocks.com/wp-content/uploads/2019/02/aprons-smocks_logo-300x92-1-1-300x92.png Mike Cielinski2018-05-20 07:00:512018-10-25 08:17:14What Do New Delivery Trends Mean for Your Restaurant Business?